Ideally situated in the centre of Townsville, they are a four star property only minutes from the vibrant Townsville Central Business District, The Strand and Castle Hill. They have a range of spacious room types to suit all guests, including motel style rooms, larger rooms with a kitchenette, pet friendly rooms and even a beautifully appointed miners cottage. Guests can also enjoy their award winning lagoon style pool, lush tropical gardens, free barbecue facilities and free wi-fi. The executive room is a really pleasant space: bed, desk, television, air-con. All the things you need to relax and unwind. If you're holidaying, cool. If you're working, excellent. They are here to help you rest. The queen bed, with the cushy mattress and soft pillows, will take your worries away. Give them a call and let them know if you'd like a room with a balcony or a spa bath too. Oooh now they're cooking with electricity (there's no gas, there). The loft is like a mini-apartment; downstairs a living area, and upstairs a sleeping area, with a high ceiling and amazing natural light. Queen bed and a fold-out sofa (if you need it), cooking facilities, dining area, and guess what, your own private laundry. Perfection. The loft is a favourite among families and corporate travellers alike. Want more space? They can combine the loft with an executive room that has two-queen beds and a set of bunk beds, making it a two-bedroom apartment (just great for large families and groups). Travelling with the family? Or maybe just a group of you on a trip for the weekend? Not to worry. 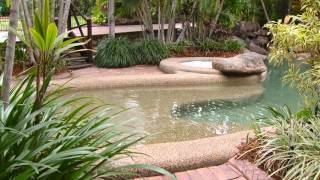 City Oasis Inn has accommodation for your family in Townsville. This room is split in two by a connecting door. In one area is a double bed, flat screen television, and ensuite bathroom. The next area has two sets of bunk beds and a flat-screen televiaion. So, if you're looking at staying short-term and on a budget, with the kids in close proximity, this is the room for you. They know accommodation. They know budgets. And they know rooms. It's simple. The two-bedroom combination gives you both the normal executive room and the kitchenette. So, you get all the yummy facilities, the kitchenette, two beds, and two bathrooms; the best thing is there's extra room for you to spread out (especially handy on those longer holidays). And because you have separate sleeping areas, it's perfect for a little privacy. Well, they don't want to be too presumptuous but they're guessing that if you're looking at this room type, you want to know why it's so well liked. Perhaps having your own cooking facilities makes you feel more at home. They think it definitely helps to be able to cater for a large brood, and you can do just that. Just for you, they've stocked the kitchenette with a full-size fridge, microwave, and hot plates, plus all the extras for you to make a family dinner. Just want something simple and at a low-price? Comfortable, that feels just right? City Oasis Inn has affordable accommodation for your next stay in Townsville. The standard room has ensuite bathroom, televiaion, air-conditioning, the best bed you'll ever sleep on. Plus, they'll pick the room that's right for you, whether you want to sleep one or two or three people, they've got you covered. Love to cook? Their executive kitchenette rooms are open-plan spaces, with queen bed and cooking facilities included. Being able to cook for yourself, you'll feel like you never left home! Don't you hate it when you go to cook on holidays and you can't find the potato peeler? The spatula? They've thought of everything, even the kitchen sink! The Cottage is a beautiful miner's house from the 1880's styled to embrace its original heritage. They really love this place. Just looking through the photos, you'll see that there's a bit of magic in here. There are two bedrooms, a kitchen, two verandahs, a living area, and a large back yard.